Food has always been a popular choice for art projects, whether in the form of still life paintings or cute, pastel amigurumi versions of real life food. It symbolizes a lot of things for us, and we immortalize it in our art as a way of recognizing the importance of its place in our lives. It sustains us, brings us together, and inspires us. Of course, some food is better off staying in our fond memories than being put in our tummies, especially as we get older and have to watch what we eat. 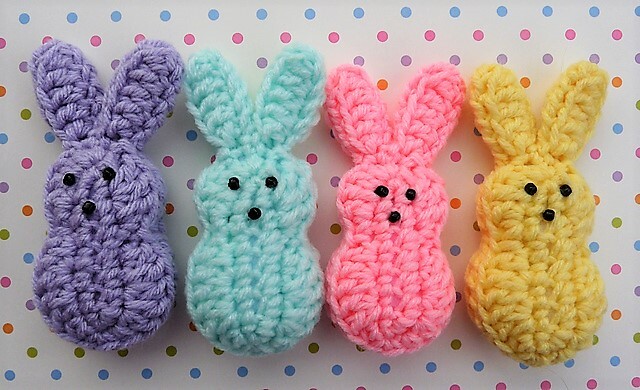 That doesn’t mean, however, that we can’t still appreciate the part it played in our childhoods – like these crocheted Easter Marshmallow Bunnies. Whiskers and Wool’s free crochet pattern is a fun take on these soft, bright treats and you’ll want to make several in a variety of colors in order to appreciate the full effect. These would also make a great centerpiece for a springtime party, layered together in a basket full of fake grass, green ribbon, or raffia. You’ll also need to know the following stitches: chain, slip stitch, single crochet, half double crochet, double crochet, and regular stitch. Each of these little guys will measure 4″ tall and 1 3/4″ wide. The pattern calls for a front and back piece, and then using whip stitch, the sides will be sewn up as the fiberfill goes in (the ears do not need stuffing, just the body). If you’d like to create your own bevy of Easter bunnies, you can find the pattern Whiskers and Wool and there’s another version on Ravelry, courtesy of Dani Speigle.